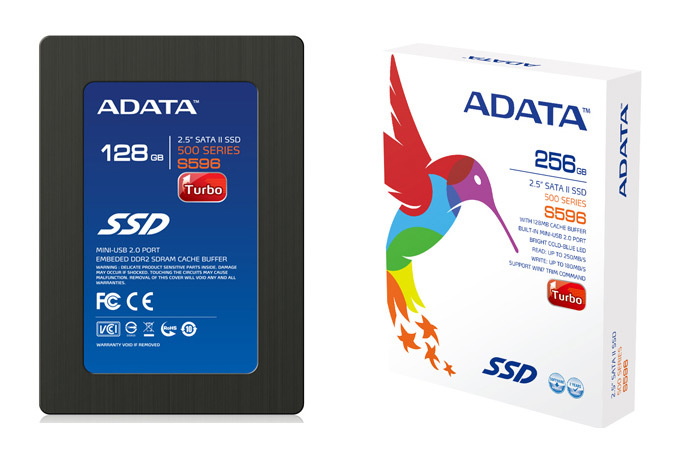 ADATA Technology today announced the first SSD, which using JMicron JMF616 controller and provides read speed up to 260MB per second, and write speed up to 210MB/S. The new 2.5-inch S596 Turbo SSD feature SATA II and mini-USB dual interface, which makes it usable either as an external portable storage, or as an installed disk in laptop or even in desktop PC with a 3.5″ converter. It has brushed aluminum chassis, 128MB DDR2 buffer, has a TRIM support for reduced boot times, backed by 3-year warranty is available in 32G / 64G / 128G / 256G storage capacity.It is expect to be available soon.